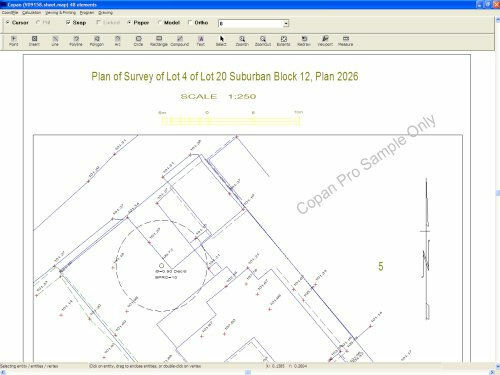 Copan Pro is a very functional and user-friendly desktop / netbook geomatics engineering tool for computing and managing plane land survey coordinates and for drafting and plotting survey maps and plans / plats. Encompasses all the capabilities of Copan Lite: COGO, field and map calculations, coordinate transformations, import/export capabilities, and other functions. Processes Leica digital level GSI data. Converts Leica Sets of Angles GSI files directly to IOB format. Shares drawing files with Copan Pro+DWG an edition of Copan that exports data to AutoCAD DWG files. While there is no fee for trying Copan Pro, to unlock it you must request a key. Once you install and agree to the conditions of use, the license will last for up to 30 days. 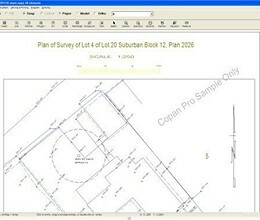 * Copan Pro download link provides trial version of the software. Nonio C is a program for modeling large topographic and cartographic surveys using triangles, contour lines, slope charts, color shading, sections, and three-dimensional views. Copan Pro has been rated 1.5 out of 5 points. A total of 4 votes cast and 0 users reviewed the software. Build accurate insurance concrete construction estimates while saving time and money. Distributed in over 60 countries & on the market for over 20 years, 12d Model is a proven world leader in civil engineering, water engineering & land surveying software.